It’s mid-February and I’m seriously missing summer! So I thought some lighter flavors were in order! This cauliflower rice is everything, you guys. It’s flavorful with cool, crisp and zesty notes, it’s easy to pull together and pairs well with almost any protein! When it comes to cauliflower rice, I’ve found that the key is to not over-saturate it while cooking. A little bit of oil goes a long way, and if you get too much, you’ll end up with a mushy rice (just ask me how I know). Plus, I love the little pieces that get a bit crispy! It adds another nearly “caramelized” flavor that is surprising and delicious! Warm the olive oil in a skillet. Add the garlic and saute until soft and fragrant. Season the cauliflower rice with the salt, then add it to the skillet. Stir to mix with the olive oil and onion (it’s ok if it isn’t “drenched” with oil!). Cover and cook, stirring every few minutes. Cook until it reaches desired tenderness; I cook mine for around 15 minutes. Remove the lid and cook for just a few more minutes until the cauliflower begins browning in spots. 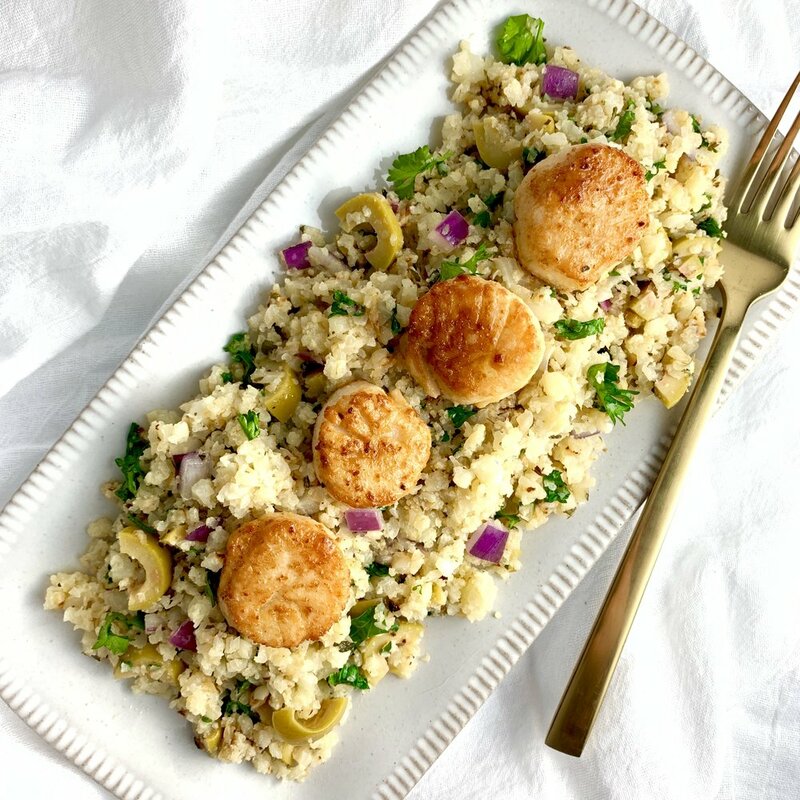 Serve with scallops or your preferred protein! Combine all ingredients in a mason jar and shake vigorously.